I don't think it would be a gross exaggeration if I told you one of the proudest moments of my poetry career was being asked to write my poem about dog poop from my new book Atrocious Poems A To Z on the walls of the Rockford Art Museum, then getting local morning show anchor Andy Gannon to read from my dog poop poem live on the air. We don't get paid much as poets so we must take our secret pleasures where we can. Sort of gather our leavings where we may, so to speak. Although I made sincere attempts to teach some heavy literary lessons about form, meter, and literary device in the book, D Is For Dog Poop is not one of those cases. It is an unabashed cry for attention. As Willy Wonka says in Willy Wonka and the Chocolate Factory, "A little nonsense now and then is relished by the wisest men." The expression on the face of the dog is a great touch by illustrator Jenny Mathews here. 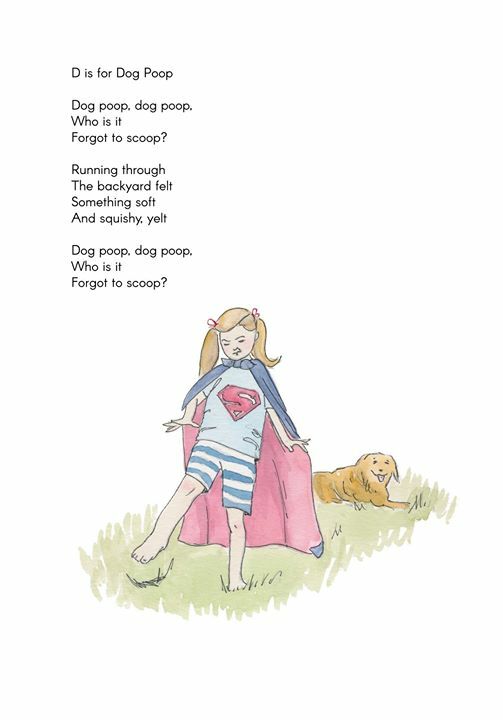 I'd like to go on to describe the complexity of this poem and its literary merits, but it's a poem about dog poop.